Greg Creed, Chief Executive Officer of Yum! Brands, served food to children in a community in Jinotega, Nicaragua, earlier this fall. Creed and a team of Yum! 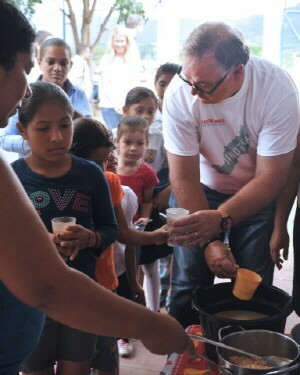 employees were on a humanitarian trip in Nicaragua as part of the Company’s Feed the World Ambassador Program. The new employee leadership program is part of the Company’s global World Hunger Relief effort that raises awareness, volunteerism and funds for the United Nations World Food Programme and others. LOUISVILLE, Ky.--(BUSINESS WIRE)--Yum! Brands (NYSE: YUM) announced its World Hunger Relief effort has raised $640 million in cash and food donations in the fight against global hunger since the program’s inception in 2007. Yum! Brands’ World Hunger Relief effort is the world’s largest private sector hunger relief initiative, spanning more than 125 countries, over 41,000 KFC, Pizza Hut and Taco Bell restaurants and 1.5 million associates. The initiative began in 2007 in an effort to raise awareness, volunteerism and funds for the World Food Programme (WFP) and other hunger relief agencies. Yum! also adopted the community of Jinotega, Nicaragua, this year, as part of the Company’s new Feed the World Ambassador Program, which supports infrastructure improvements at local schools that WFP serves. The new employee leadership program is part of the Company’s global World Hunger Relief effort and is a way for Yum! employees to fight global hunger and make a lasting impact in a community in need. This year the Company created unprecedented awareness and engagement with a new PSA featuring multi-Grammy Award winner and international superstar Christina Aguilera’s recent humanitarian trip to Ecuador where she witnessed the effects of hunger first hand and helped beneficiaries of WFP’s nutrition programs. Aguilera has served as a volunteer spokesperson for World Hunger Relief since 2009 where her participation has helped raise millions for the WFP and other hunger relief agencies. She also serves as an “Ambassador Against Hunger’ for WFP where she has traveled on several humanitarian trips with them. The 2015 campaign raised approximately $40 million in overall cash and food donations for WFP and others. Yum! also addresses hunger in the U.S. through its Harvest program. Since 1992, the Company’s brands have contributed more than 183 million pounds of food to over 3,000 nonprofit organizations for those at risk of hunger in the U.S. Since its launch over two decades ago, Yum! Harvest has become the largest prepared-food donation program in the world. The Company continues to expand the program globally. For more information on Yum! Brands Community initiatives around the world, visit www.yumcsr.com or read the latest news in the Yum! Global Newsroom, www.yum.com/newsroom. Yum! Brands, Inc., based in Louisville, Kentucky, has over 41,000 restaurants in more than 125 countries and territories. Yum! is ranked #228 on the Fortune 500 List with revenues of over $13 billion in 2014 and is one of the Aon Hewitt Top Companies for Leaders in North America. The Company's restaurant brands – KFC, Pizza Hut and Taco Bell – are the global leaders of the chicken, pizza and Mexican-style food categories. Outside the United States, the Yum! Brands system opens over five new restaurants per day on average, making it a leader in international retail development. The World Food Programme is the world's largest humanitarian agency fighting hunger worldwide, delivering food assistance in emergencies and working with communities to improve nutrition and build resilience. Each year, WFP assists some 80 million people in around 80 countries.